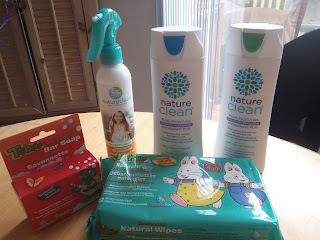 I was recently sent a very nice package from Nature Clean to test out and review with my family. In the package was shampoo, conditioner, air freshener, body soap and baby wipes from the treehouse line! I have been using the shampoo and conditioner for myself the last 3 weeks - and am happy to report that my hair feels great. It is shiny, soft and CLEAN! The bar soap has been used by me and both the boys and none of us have flared up with our eczema - it is extremely gentle. The soap doesn't have any flowery fragrances to it - just a clean scent! I used the baby wipes on Kyle and was really pleased with them. They don't have a greasy feel to them - and they have just the right amount of moisture level to clean a dirty bum. They are soft and gentle, and have not irritated his sensitive skin at all. We went through the entire package with no issues! The air freshener I have used to add a clean scent to our rooms - again, there is no chemical, flowery fragrance to it - but it does leave a fresh smell to the rooms! Nature Clean has paired up with Treehouse to create a kids line that is free from ingredients such as sodium lauryl sulphate (SLS), sodium lauryl ether sulphate/sodium laureth sulphate (SLES), propylene glycol (PEG), parabens, petroleum ingredients, synthetic perfumes and dyes. 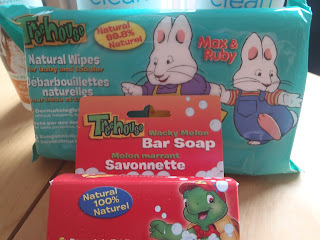 I've always wanted to try these products out! I love how they have Treehouse! I love Nature Clean! There stuff is awesome! The Treehouse line is a fave! I've been wanting to try out Nature Clean for quite sometime.